I originally read this picture book (which was originally published in German in 2007) back in April, when I was visiting a dear friend in New Zealand. I was in the middle of a break-up and was feeling pretty overwhelmingly sad, and she had this book checked out from the library and left it outside the door of the room I was staying in for me to read. I read it, and liked it, enough that I kept thinking about it and eventually checked it out from the library back home in Brooklyn. You can see more from this book on Brain Pickings, though scrolling through the images on a screen isn’t quite as satisfying (for me, anyway) as turning pages. My boyfriend checked Chu’s First Day of School out of the library because he really likes Neil Gaiman, and we read it together because I like picture books. Apparently this is the second book (with text by Gaiman and illustrations by Rex) about a young panda named Chu, and it’s slightly mystifying as a standalone (first page: picture of panda in a windy field of grass and flowers, with the text “There was a thing that Chu could do”) but I guess it makes sense immediately if you’ve read the first one. So, right: it’s Chu’s first day of school and he’s worried about whether the other kids will be nice and if they’ll like him. His parents reassure him, but he’s still worried. At school, each kid has to introduce themselves, and has to say one thing they love to do: Chu looks nervous, and is the last kid in the room to talk. And then we learn what, exactly, Chu can do. 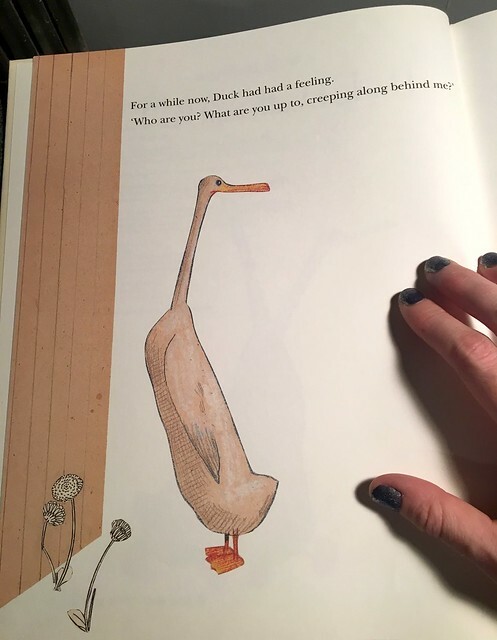 The illustrations are totally what makes this book, moreso than the story. I love the whole animal population of Chu’s school/world: his teacher is a (non-panda) bear, and there’s a crossing guard who’s a horse, and in the page showing parents dropping their kids off, there is definitely a little octopus crossing the street next to a big octopus wearing a hat. In the classroom, there’s an alphabet banner encircling the room that, instead of letters, has an ape, a bison, a cat, et cetera. One of Chu’s classmates is an overall-wearing rhinoceros who likes to dance; another is a duck who likes to be funny. Adam Rex’s art is colorful and precise: the animals and the spaces they inhabit feel equally detailed and vibrant, which is nice. I hadn’t heard of this rhyming picture book, but when I saw it at the library, the front cover made me want to pick it up: a solid-looking dog on a ladder, adjusting a mysterious contraption made of pots and pans and colanders and whisks and wires, in front of an old TV that seems to be showing a staticky picture of a poodle. How could I not be intrigued? The book opens with Wilma and Walter Wimbledon being woken up by a weird noise. Walter goes and checks it out, and comes back to say it’s just their dog, Stanley, howling at the moon. As the night continues, each of the four Wimbledon kids gets woken up by something, and each time Walter checks it out but comes back saying, “It’s only Stanley.” Walter doesn’t seem at all perplexed by Stanley’s nighttime activities, offering a straightforward explanation for each weird noise or smell: Stanley “fixed the oil tank” or is “making catfish stew,” as if these are perfectly normal things for a beagle to be doing. What Stanley is actually up to is … considerably more interesting. The art of this book is fun: I love the way each kid who gets woken up piles into their parents’ bed, which obviously gets a bit full by the end, and I love the wordless spreads where Walter goes to see what Stanley’s up to, accompanied each time by the family cat, Max, who seems to know more about what’s going on than Walter does, and whose curiosity means that he returns to bed in a slightly different state after each investigation. Those wordless spreads are totally my favorite part, especially the one with Stanley in the kitchen with a crazy setup of beakers and retorts, determinedly stirring a pot bubbling over with a mysterious green liquid (which the cat, of course, laps up from a spill on the floor). I really like wordless (or almost-wordless) picture books in general, and this story of a cat with “a silly name that belies his predatory nature” (in the words of Sarah Harrison Smith, writing in the New York Times) is a whole lot of fun. Mr. Wuffles, the title character, isn’t interested in any of the toys his people buy him: on the first page of the book, we see him disdainfully stalking away from a new goldfish-on-a-string toy, the pricetag still on. In fact, Mr. Wuffles ignores a whole bunch of toys with the price tags still on them: mouse toys and feather toys and a ball with a jingle bell inside, a shuttlecock, a ball of rubber bands. One toy, sans price tag, catches his eye, except it’s not a toy at all: it’s a spacecraft, with five very small aliens inside. The aliens are thrilled to have made a safe landing and are about to leave their ship for a photo opportunity, tiny flag in hand, when Mr. Wuffles gets his claws on their ship. Mr. Wuffles is delighted. The aliens, not so much: after being batted around, they all look a bit queasy, and, worse, their ship has been damaged. More worried than triumphant (though still with their flag in hand), they leave the ship, and are nearly squashed by Mr. Wuffles, who gets distracted by a ladybug at just the right moment. The aliens make a run for it, and find a safe spot under the radiator, which is also, it turns out, where the ants and ladybugs of the house hide from Mr. Wuffles. With the help of art (cave-painting-style hunt scenes the insects have created on the walls, and a similar scene the aliens create), the aliens and insects bond over their shared status as prey on the run from a creature many times their size. After a group photo and a shared meal, the aliens show the insects their broken spaceship parts; the insects give them material from which to make replacements (think of all the stuff that gets lost under the radiator! ), and then they all craft a plan to get the aliens safely back to their spaceship. Mr. Wuffles is not so delighted anymore. This book, with text by Peter F. Neumeyer and illustrations by Edward Gorey, ends in a way that’s not very satisfying to me, but still manages to be pretty pleasing overall. The art and design are really great: the book sticks to a color palette of black, white, and orange, and makes a lot of use of black backgrounds and negative space, with Gorey’s crosshatched drawings looking lovely whether they’re white on black or black on white. The story is really more of a premise/question: it opens with four young siblings stumbling in the dark, wondering “What happened to the light?” The kids’ speculations as to what might have happened are the best thing about the book: they wonder things like: “Did the ink spill? Did our eyes burst?” “I know, we’re underwater,” says one page. “Aren’t we born yet?” says the following. (This is a great spread: on the right-hand page there’s a Victorian-era couple in a rowboat, dad in straw boater, bowtie, and striped suit; mom in a big flowered hat and a flowing dress, and on the left-hand page are the kids, underwater, standing beneath the black surface, below the wavelets.) I also love the orange spread of an ornately tasseled curtain, with the family cat making an appearance in its folds, and the text of “Did the curtain drop? Is the world finished?” After all this speculation, the oldest child explains how the earth’s rotation causes day and night, but his siblings aren’t entirely satisfied with that answer and come up with another they prefer. Annette LeBlanc Cate is a hobbyist bird-watcher, an enthusiastic amateur rather than an expert, which is definitely a strength of this non-fiction picture book that serves as an introduction to birdwatching for kids. 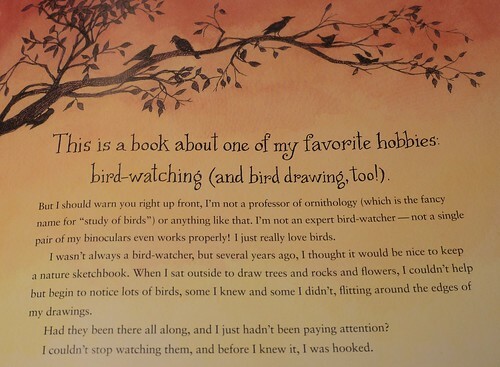 I like that the author emphasizes that anyone can watch birds, anywhere: you just need to pay attention (and it helps if you take notes/draw the birds you’re looking at). The ink and watercolor illustrations of this book are charming and funny and sometimes downright lovely: there are lots of cartoon birds complete with speech bubbles, and sometimes the layout is in panels like a comic, but my favorite pages were the ones with bigger/simpler background illustrations, like the one below that shows a branch of a tree with various birds perched on it, against a peach/orange sunrise-colored sky. Some of the spreads are a bit busy for me, though I do like the pages showing birds by color (a rainbow of birds, a page of black-and-white birds, a page of brown birds). And I like the strategies the book introduces, like: when you’re looking at a bird, pay attention to how it’s shaped, and what that might tell you about it (for example: you can probably tell birds that fish from birds that don’t, which is illustrated hilariously with a series of illustrations of a cardinal trying to fish, and not doing so well). Vanessa’s sister Virginia wakes up one day feeling wolfish. Everything bothers her, she won’t talk to anyone, and she just wants to be alone, under the covers, in bed. Vanessa wants to cheer her up, but isn’t sure how. She tries just keeping Virginia company, cloud-watching with her, and maybe that helps, but Virginia still doesn’t want to talk to anyone. “If I were flying right now I might feel better,” Virginia eventually says, and when pressed says she would go to a place with “no doldrums,” a place called “Bloomsberry.” Vanessa can’t find Bloomsberry in the atlas, but that’s not a problem: she’s an artist, after all, so she can paint it and draw it and construct it from cut paper. And she does, and it helps: by the end of the book, Virginia’s back to girlish rather than wolfish. But the story (which is by Maclear) isn’t the highlight of the book for me—the art (by Arsenault) is. Arsenault works in ink, pencil, watercolor, and gouache, and her work matches the mood of the book wonderfully. For the spreads showing Virginia’s wolfish bad mood there are lots of blues and greys and shadows; Virginia, as wolf, is shown as a smudgy pencil drawing, dark and wild in contrast to Vanessa with her pink cheeks and yellow dress and yellow hair bow. As Virginia retreats under the covers, the color palate diminishes to almost only and grey and black and shadow, even for Vanessa. 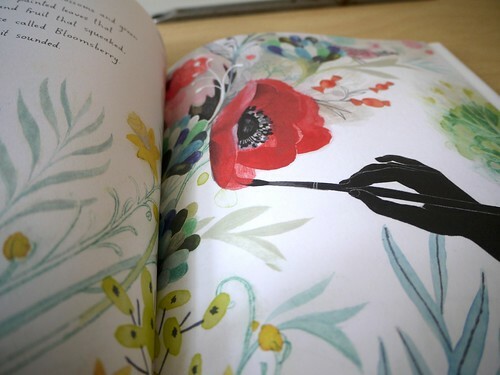 But then there’s Vanessa’s art, the first spread of which is shown in the picture above: there are yellows and greens and blues and pinks, and the beautiful red of that poppy. Reds and pinks feature heavily in the next two spreads, and then comes one of black and flecks of pale blue on a yellow ground, which is a perfect inversion (in color and in art and in text, too) of an earlier spread that was pale grey-blue and black with yellow specks. (It works thematically: the first spread is about how with Virginia’s sorrow “the whole house sank” and “up became down.” The later spread is about how “the whole house lifted.”) It’s really lovely. How many pairs will there be in one year? Gravett isn’t just concerned about the numbers, though: she shows the rabbits themselves, a whole rabbit society stuck playing by Fibonacci’s rules (one of which is that no rabbits can leave the field) and what the consequences of rapid population growth are. But putting it that way doesn’t quite get across the playfulness of the whole thing. 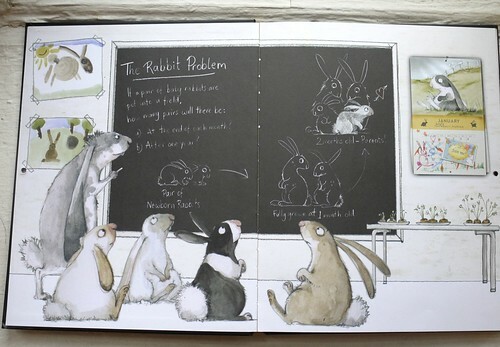 The book’s set up as a calendar, where each month is described as some variation on “The Rabbit Problem”—so January, with just one rabbit in the field (Gravett starts at the very beginning of Fibonacci’s sequence, rather than starting with two bunnies right away as described above) is “The Lonely Rabbit Problem.” February, with two rabbits, is “The Cold Rabbit Problem,” and so on. Throughout, the calendar is layered with art and hand-lettered words and more: February includes a list of “Ways to stay warm” (“Knit a sweater, Hop, Think warm thoughts, Snuggle up”); August includes a reminder to “Buy sunscreen.” And there are fold-out or pop-out elements, too: an invitation, a faux knitting pattern, a bunny-authored/edited newspaper, a cookbook full of rabbit-focused recipes involving carrots. And oh, the bunnies themselves. They’re wonderful: big-eyed, pink-nosed, hilariously expressive even when the field starts getting crowded. And did I mention it’s really really funny? The faux knitting pattern (for an orange-and-white bunny-eared sweater) includes things like: “Tension: There will probably be a lot” and a list of abbreviations that includes things like “ht = have a cup of tea” in addition to the expected “k = knit” and “p = purl.” The rabbit newspaper includes an article on the problem of boredom plaguing the field, and says that “younger rabbits are taking up vandalism and gamboling to fill their days.” Gamboling! Ha! Meanwhile, it’s January 14th, and this is the last of the three library books I’d had checked out since before December 31st. Which means that it’s now time to turn my attention to my own shelves, since I’m trying to stick to the rules of the TBR Double Dare between now and April. No more exceptions. Here goes! 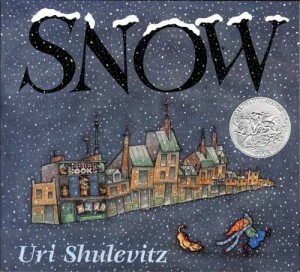 I forget where I heard about this book, which made the Caldecott Honor list in 1999, but it seemed like a pleasing winter-time picture book, perhaps especially given our not-very-snowy-yet winter this year: we had an early slushy snow Halloween weekend, but haven’t had any since. Snow is set in a gray-skied town with a big central square and a crooked skyline of narrow houses with leaning chimneys. The town has at least two bookshops (Mother Goose Books and More Books), and it is winter in the town: winter, and it’s going to snow. The radio says it’s not going to snow, and the television says it’s not going to snow, but one little boy with a dog sees the first flake and is sure it’ll turn into something that sticks. All the grown-ups disagree, as grown-ups do (“It’s nothing,” or “It’ll melt”), but the boy, frolicking in the square with his dog long after the grown-ups have gone inside, is right: snow! The illustrations in this book are what I like best about it: those higgledy-piggledy houses, the varying grays and blue-grays of the watercolor skies, and of course the snowflakes themselves, dotting the sky like stars and then like more than stars, in more places than just the sky. “All snowflakes know is snow, and snow, and snow,” the text says at one point, and there it is, the logic of winter, snow piling on the ground and on grown-ups’ hats and coats, snow transforming the town into something magic. Wabi Sabi is a seriously gorgeous book. It’s big (the pages are 11 by 11 inches) and when you have it closed, the spine’s at the top—so you open it like a wall calendar, and it’s made up of a series of two-page spreads. 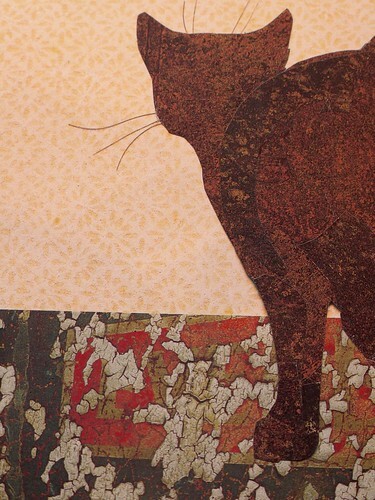 The art, by Ed Young, is lovely: his collages, made of cut paper and other materials, are layered and full of texture. The colors in the book are sometimes vivid, sometimes muted: the bright green of pine needles in one spread is followed by a dusky-blue spread that incorporates a photo of Kyoto in the evening. Each spread also includes a column of Japanese characters, which turn out to be haiku by Basho and Shiki: they’re translated in the back of the book, and each one resonates, loosely, with the spread in which it appears, so it’s pleasing to flip back and look at the images again while thinking about the haiku. The main text of the book, by Mark Reibstein, is less exciting to me than the art, but it’s well-written and interesting enough. Wabi Sabi, in the book, is a cat who lives in Kyoto: she’s never thought to wonder what her name means, but some visitors ask her master about it, and her master just says that it’s “hard to explain.” Wabi Sabi’s curious, now, and asks another cat and a dog if they know: but they also just tell her it’s hard to explain, though they each also offer a haiku that gives a little insight. To really understand her name, Wabi Sabi travels to Mount Hiei, where she meets a monkey who teaches her about beauty in the simple, imperfect, quiet, dark, and natural. Contented, she heads back to Kyoto a little wiser. The text is all presented in haibun form, which I hadn’t heard of before, but which the back of the book explains: it’s a traditional form used by Basho and others, in which each haiku is preceded by a short prose passage. Reibstein’s haiku sometimes feel lacking (e.g. “A wise old monkey/living among the pine trees/knows wabi sabi”) but are sometimes really satisfying (e.g. “Yellow bamboo stalks/bow by teahouse doors so low/emperors must kneel”).